All cat parents want the best for their kitties. Stewart Fiber Formula Cat Treats were developed by a veterinarian for cats with special dietary needs. These treats provide supplemental fiber with lasting health benefits. We gently process the all-natural ingredients in Fiber Formula ocean fish flavored treats. Serve your cat these crunchy, high-fiber treats and see the healthy difference. 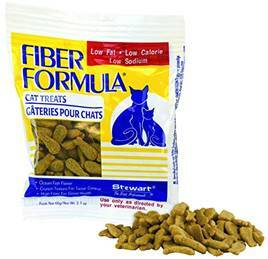 Stewart Fiber Formula Cat Treats help eliminate hairballs. Low in fat and calories, these treats are perfect for cats in weight control programs, or cats with diets restricted in sodium or fat. We fortify Fiber Formula cat treats with essential vitamins and minerals including taurine, for healthy heart function and strong eyesight. Your veterinarian can recommend feeding guidelines based on your cat’s overall health, fitness and dietary needs. Fish-shaped treats bring extra fun to playtime with your cat. Brewers Rice, Corn Flour, Poultry By-Product Meal, Powdered Cellulose 14% (A Source Of Fiber), Poultry Fat (Preserved With Mixed Tocopherols And Citric Acid), Corn Gluten Meal, Dried Beet Pulp, Flax Seed Meal, Lecithin, Potassium Citrate, Dried Brewers Yeast, Fish Digest, Calcium Sulfate, Taurine, Dl-Methionine, Choline Chloride, Salt, Vitamins And Minerals.